Ana Lupaș (b. 1940), author of drawings, objects, tapestries, environments, happenings, installations, performances. Graduated from the Academy of Fine Arts, Cluj, 1962. Corresponding member of the European Academy of Sciences, Arts and Humanities Decorated with the Order of the Star of Romania. Selected exhibitions: The Solemn Process 1964-2008, Tate Modern New Display (2016, solo); Art Encounters Biennale 1st edition: Appearance & Essence – ArtEncounters, Timișoara (2015); Ludwig 25. The Contemporary Collection, Ludwig Museum, Museum of Contemporary Art – Budapest, Budapest (2014); Good Girls. Memory Desire Power, National Museum of Contemporary Art (MNAC), Bucharest (2013); One Plus One Equals One, Mihai Nicodim Gallery, Los Angeles, CA (2012); Global Conceptualism – Points of Origin, 1950s-1980s, on view at: MIT List Visual Arts Center, Cambridge, MA / MAM – Miami Art Museum, Miami / Walker Art Center, Minneapolis / Queens Museum of Art (QMA), New York (1999-2000); Lacul Morii Interactive Space, outdoor, Bucharest (1996, solo); Memorial of Cloth, outdoor, University Square, Bucharest (1991, solo); 18° Bienal de Sao Paulo – Bienal de Sao Paulo, São Paulo (1985); Meeting with… Ana Lupaș, Musée Cantonal de Beaux-Arts, Lausanne (1982, solo); Preliminaries for a Round Grave, outdoor, Badacsonytomaj (1978, solo). The artistic activity of Ana Lupaș is closely related to the city of Cluj-Napoca, where she studied and taught, influencing generations of students that chose an artistic career path. At the same time, the artist draws on these precise locations by belonging to the larger conceptual family of the European neo-avant-garde from the 1960s and 1970s, marked by the experimental spirit she enthusiastically received from the very beginning – the International Art Triennale in Stuttgart, the International Tapestry Biennale of Tapestry in Lausanne, the Young Artists’ Biennale in Paris, etc. 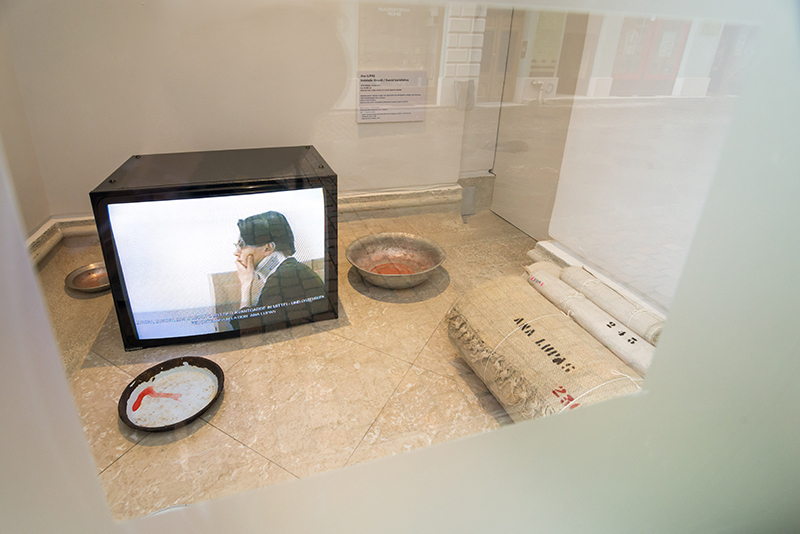 One method of reading the foundational concepts that define the artistic instrumentation of Ana Lupaș may be attempted with the art historian, László Beke, through the provided inventory of materials used (over 80 in total) – iron, thread, wax, blood, dirt, etc. Another method may start from the communal typologies the artist has worked with over time – from the groups of children for Mașinile de zburat [Flying Cars] or Joc de-a prometeii [Promethean Games], to the local women from the Transylvanian village, Mărgău, for Instalația umedă [Wet Installation]. Another approach could appeal to the “elements of ecological paradise”, as Anca Arghir calls the rural environment where her installations have been inserted – a “re-naturalization” of the artistic space. Last but not least, a main thread to understanding the forms of “visual initiation” that Lupaș operates could be “the generations” of works through which the idea of serialization is revoked and replaced by a much more natural-human one, as is the case in Cămășilor de identitate [Shirts of Identity]. Ana Lupaș’s collected works cannot be understood in fragments, but only in conjunction with the aesthetic program of “the reconciliation of the person with nature and with his or her self”, characterized as such by Mihai Drișcu, which also brings with it “the promise of happiness” and of eternity. Ana Lupaș’s works – when integrating organic materials – are invested in a vitality that exacerbates and saturates the space they’re placed in, encouraging a re-imagination of ancient mythologies in a contemporary way. An example in this direction would be the recurring motif of Haina [The Clothing], which becomes the vessel of the body that never forgets anything.